There is certainly something to be said for truth in advertising. Looking at the group name and the album title, really sets the stage for the music within. 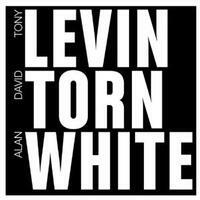 Take stick/bass legend Tony Levin, add in the guitar magic that is David Torn and put Yes drummer Alan White into the mix to hold down the beat, and you’ve got a really good idea of the musical experience that’s about to begin. This has a lot in common with another Levin/Torn collaboration, Bruford Levin Upper Extremities. This lacks the horns that were heard in that group, but shares a lot of the same musical territory otherwise. It’s highly recommended for fans of any of these musicians. This comes in mellow and atmospheric but turns out into some seriously heavy, King Crimson styled sounds. It’s a pounding fast paced and deliciously noisy jam. Levin leads out here and they turn it out into another fast paced jam that’s quite tasty. The overlayers are less noisy and metallic, bringing more of a melodic modern progressive rock sound to the table. Don’t mistake the melodic nature for mellow, though. This thing really rocks in a great way. There are some screaming guitar type sounds later in the piece. This thing really works through a lot of changes and different modes and motifs. It’s a serious screamer that’s very effective. Coming in with a bouncing rhythmic texture, it’s almost industrial, but more like the sound of pounding metal machines than Nine Inch Nails. The percussion really shines on this tune and there are alternating segments that are more atmospheric in nature. There’s more of a groove to this with layers of hard rocking sound lain over the top. This is quite a cool tune that’s almost like combining an old surf music sensibility with King Crimson-like jamming. There’s a killer rhythmic section driven movement later that feels rubbery. Guitar soloing screams over the top as that continues. This comes in feeling a lot like modern King Crimson. Guitar sounds scream overhead at times and this moves through several different textures and styles as it continues. It’s a cool tune. A powerhouse jam, this is fast paced and hard rocking with some killer sounds. The rhythm section is really frantic and crazed, but in a good way. This is one of the cooler tunes on the set. It has sections that are quite metallic and other points where it turns more sedate. This comes in with textural motifs. While other cuts work from that type of territory into hard edged music, this one stays more atmospheric. It’s a cool bit of dark ambience, perhaps akin to some of Robert Fripp’s soundscapes. The title really fits this quite well. There’s a soft element here, but it’s also dark. It seems to wrap around. It’s like mixing some sort of cool space music with King Crimson-like stylings. This short piece is rhythmically groove oriented and atmospheric in terms of the upper layers of sound. Here’s a mellow tune that’s very atmospheric and dramatic. The atmospheric sounds that build up here are very tasty and beautiful, but still have a dark, abrasive edge. There’s a lighter, less raw texture to the early modes here. It gets some harder edges as it continues, though. As this continues it feels a bit like something from Steve Vai or Joe Satriani in some ways. There are some screaming guitar bits later. It drops towards the atmospheric later. Some sound bites are layered over sedate music and a cool bass line on the outro. Appropriately this opens with some metallic crunch before a smoking hot groove comes into play. It detours into a little interlude before pounding back out. It turns seriously intense as it continues, but then works out to more atmospheric (but still rhythmically hard edge) territory. Ouch, the title sounds painful. This comes in as a seriously incendiary shredfest, but then turns more melodic after a while. It’s another cut that would feel at home in a modern King Crimson set. It gets pretty rubbery at times. This comes in mellow and tentatively. It powers out after a while into more of a rubbery kind of jam that’s got atmospheric elements. This one is percussively driven more than anything else.